JUNEAU — As the state of Alaska prepares to complete construction of two large new ferries, the Alaska Marine Highway System warns an additional — and unforeseen — $30 million in public money must be spent before the ships can be used. In addition, a meeting last week of the Alaska Marine Transportation Advisory Board revealed that tens of millions more in state-federal spending will be needed ashore to support the ferries Tazlina and Hubbard when they leave the hands of their Ketchikan shipyard and enter state service. “We have two boats that the department says don’t meet their concept of service delivery and we can’t use them. That, to me, is the mind-boggling, mind-blowing issue at hand,” said Robert Venables, chairman of the advisory board, by phone on Wednesday. The additional $30 million would be used to install crew quarters aboard each of the ferries, allowing them to be used on longer routes than originally planned. The changes are needed because the new ferries were designed for a niche role, but cuts to ferry service mean the ships will instead have to enter general service. “People can be frustrated about the expenditure of money and the change of plans, but the reality is that our plans changed for us. We’re reacting in the best way we can,” Marine Highway director Shirley Marquardt said Wednesday of the request for increased funding. The Dunleavy administration has not yet responded to questions about whether or not it supports the proposal. New Alaska Department of Transportation commissioner John MacKinnon was said to be on personal leave by spokeswoman Aurah Landau. History shows the problems began well before that. The new ships are part of the Alaska-class ferry program conceived in 2006 under then-Gov. Frank Murkowski. At the time, the Alaska Department of Transportation was finalizing plans for the Juneau Access Project, an effort to improve transportation between the state capital and the North American road network. In that year, DOT administrators settled on a plan to extend Juneau’s road network northward. Rather than continue the entire way to Skagway across a mountainous and costly route, the extended road would have ended at a new ferry terminal. State documents describe a series of “shuttle ferries” covering the remaining distance between the new terminal and Haines and Skagway. After the road project became entangled in legal battles, the state’s plan changed in 2009 from a series of shuttle ferries to a single larger vessel capable of carrying 60 cars and 500 passengers at a cost of $120 million. To enable longer voyages, the new design included living space for the ship’s crew. When Gov. Sean Parnell entered office, he changed the concept again, this time to two smaller “day boats" whose crews would live ashore. By removing the crew quarters and limiting other features of the design, the state could build two ships for the price of one. At a time when the state was flush with money due to high oil prices, Parnell ordered the two ships built entirely with state dollars, rather than sharing the cost with the federal government. Had the state taken federal money, it would have had to allow Lower 48 shipyards to bid on the project. Instead, construction went to a facility in Ketchikan, where the administration hoped to encourage shipbuilding. The Alaska Legislature agreed with Parnell’s plan, appropriating $60 million in 2010 and another $60 million in 2011. The Alaska-class ferry project continued, even though the ships' intended job no longer existed. Meanwhile, the Marine Highway was idling and selling other ships it could no longer afford to operate. “When the politics change every four years, this is the type of result you get,” said Venables, the advisory board chairman. Despite the numerous changes in the ferries' design, director Marquardt said they could work as intended — albeit less efficiently — if they were restricted to the waters around Juneau. The state’s budget troubles don’t allow that. With state budget constrained, bringing two new ferries online means the Marine Highway System will have to take two older boats offline. Those are likely to be the Aurora and the Fairweather, AMHS documents indicate, but removing those vessels opens a hole in the state’s web of ferry routes, particularly in Prince William Sound. Putting one of the two new ferries in the Sound would cause additional problems. “These boats cannot do the run that they were designed for, without both boats operating,” said Shannon Adamson of the International Organization of Masters, Mates & Pilots Maritime Union. Coast Guard regulations limit ferry crews to 12 hours of work per day. A trip on one of the new Alaska-class ferries from Juneau to Haines, Skagway and back to Juneau is likely to be 14 hours according to ferry system projections — and that’s if weather or loading problems don’t delay the ship. A pair of Alaska-class ferries can split the work and stay within the 12-hour limit, but one ship can’t do it alone unless it is modified. That’s why, Marquardt said, the state needs to install crew quarters aboard the new ships. The alternative is to keep crews in different locations and rotate them on and off duty. Marquardt said the ferry system believes that creates more costs and more problems than installing crew quarters. If one crew sails a ferry from Whittier to Cordova and a second from Cordova to Whittier, how does the second crew get to Cordova and the first crew back? And where do those crews live? Marquardt compared the situation to a driver who travels across the Lower 48. If the driver spends a week or two on a trip, it might make financial sense for that driver to stay at campgrounds and hotels rather than buying an RV. If that driver is spending 10 or 20 years traveling, the equation changes. Marquardt said the cost of installing crew quarters would be $15 million per ship, but Adamson said she thinks that figure is “optimistic” and the true cost could end up being higher. Money for the work would come from the Marine Highway System fund, Marquardt said, and if the Legislature authorizes the expense, work could begin this summer. “We’d love to see them in service by 2020. That’s what we’re shooting for,” she said. If the Alaska Legislature approves the cost of new crew quarters, the Marine Highway and lawmakers will need to confront another problem: Many of the state’s ferry terminals can’t handle the new ships. As built, the Alaska-class ferries have car doors in the bow and stern. The state’s ferry terminals are constructed to serve ships that load from the side. Marquardt said that in addition to installing crew quarters, the Marine Highway plans to install side-loading doors aboard the new ships. Even then, new facilities will be needed in Chenega Bay, Talitlek, Pelican, Cordova and Whittier, according to documents presented to the marine transportation advisory board on Tuesday. “The total estimate for all five is about $25 million,” said Capt. John Falvey, general manager of the Alaska Marine Highway System, at that meeting. The state has also repeatedly delayed work on facilities in Haines and Skagway that were intended to accommodate the new ships. Skagway’s work won’t be done until 2022, according to an estimate presented Tuesday, and work in Haines is on hold. Marquardt attributed the delays in Haines to design and environmental issues that took years to resolve. If the Legislature or governor balk at expected costs, the Alaska Marine Highway System will face difficult decisions. The ferry system had planned to tie up the Fairweather starting in 2019 to save operating costs. The Aurora, still in service, will have to enter dry dock within two years for an engine replacement. 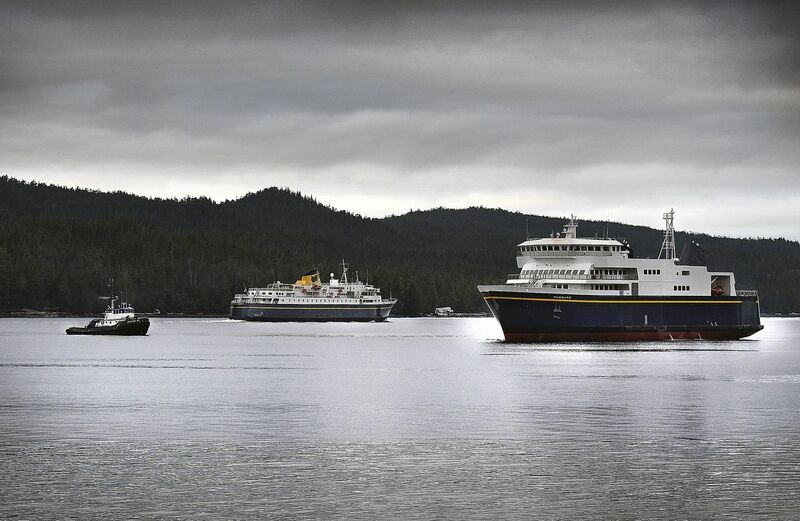 If those ships are unavailable before the new Alaska-class ferries come online, Prince William Sound towns like Cordova will lose service for as much as 10 months. Other communities would lose service for shorter periods. Renfeldt, in Cordova, said that loss would be significant for her community. Residents and visitors alike use the ferries for shopping and hospital visits in Anchorage. Some of Cordova’s famous Copper River salmon are shipped out on ferries. According to a 2016 economic impact report conducted by the McDowell Group on behalf of the Marine Highway, the effects of reduced ferry service would have fiscal effects throughout the state. “It has a measurable effect on all communities in the state, not just those off the road system,” Renfeldt said.